Treasure Life is helping improve the level of care child heart patients receive by introducing new diagnostic technology at Stollery Children’s Hospital in Edmonton. 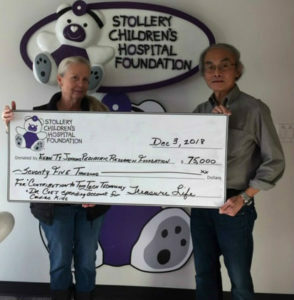 This week, Treasure Life President Charlene Jenkins presented a cheque for $75,000 to Dr. Yashu Coe, a pediatric cardiologist we partner with at the Stollery. $50,000 is going toward the purchase of diagnostic imaging software that better analyses and monitors heart health. Doctors are able to make more accurate assessments, detect and treat heart failure earlier, and reduce the number of hospital admissions and clinic visits. The remaining $25,000 will purchase heart monitoring equipment families use at home. To date, Treasure Life has donated over $400,000 to the Stollery Foundation in support of cardiac kids who receive treatment in hospitals throughout Edmonton. Thank you to our sponsors, donors, and volunteers whose unwavering commitment make our donations possible.